Life, Courage, Love, Strength all proudly describe every portion of your mind, body and soul fighting and supporting all those dealing with the devastating disease of Breast Cancer. Rise up and show your commitment to ending this disease with your own Breast Cancer Gifts. 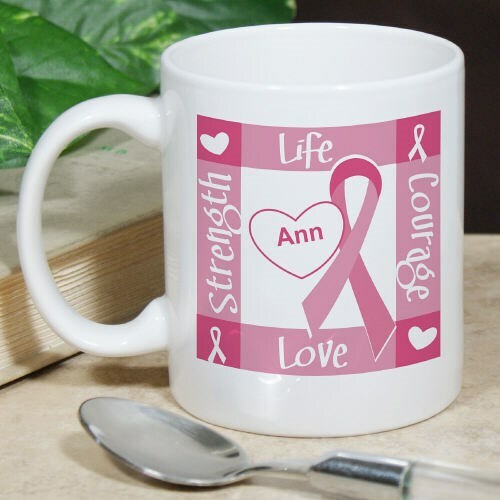 Your Personalized Breast Cancer Awareness Ceramic Coffee Mug is dishwasher safe, and holds 11 oz. Includes FREE Personalization. Personalize your Ribbon of Heart Coffee Mug with any name. Additional Info Personalized Breast Cancer Awareness Gifts from MyWalkGear.com proudly show your support in fighting this disease as well as your support for family and friends dealing with breast cancer. MyWalkGear.com has many additional Personalized Breast Cancer Shirts and Walk Gear for your special gift giving needs. Each time a gift is purchased from our Breast Cancer Awareness line of personalized gifts, MyWalkGear.com will donate a portion of the purchase price to help in the fight against breast cancer.